Power Steering, Front disk brakes. New Genuine Toyota glass windshield, vent window for doors, new side door glass and new rear cab glass. New Cab rubbers, window rubbers and all door rubbers. New door mechanical, regulators and door panels. Frame sanded and painted then undercoated. We purchased and imported this vehicle For NON HIGHWAY USE. It will be sold for Off Road Use Only Or EXPORT ONLY! !It drives great, runs excellent. A vast array of options are available for this vehicle including brush guards, winches, restoration services,tires/rims, etcetera. 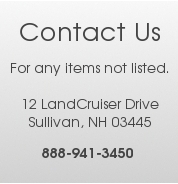 Call us with any questions at 603-847-9400 or if you want to come take a look & test drive. Shipping is available world wide. Land Cruiser is Located in Sullivan, NH USA.